The newest issue of Globe Magazine features the cover story ‘Prince Harry Proposes To Kate’s Sister.’ The magazine claims that Kate Middleton’s sister Pippa Middleton have been carrying on a secret romance with her husband Prince William’s brother Prince Harry. The magazine of course has all the details, cause they would be the first to know, right? Not only does the magazine claim they have been having a secret romance but they are predicting a royal wedding, because Prince Harry has proposed to Pippa! Globe has the scoop: A secret romance between Prince Harry and Pippa Middleton, the sister of Prince William’s bride Kate, has exploded in a shocking wedding proposal. Only the current GLOBE has all the thrilling details about the bad boy prince and his hush-hush romance with pretty Pippa. So now that Pippa is single and so is Prince Harry there is the possibility they could get together. But as for the magazine’s claims, all groundless speculation to sell more issues. 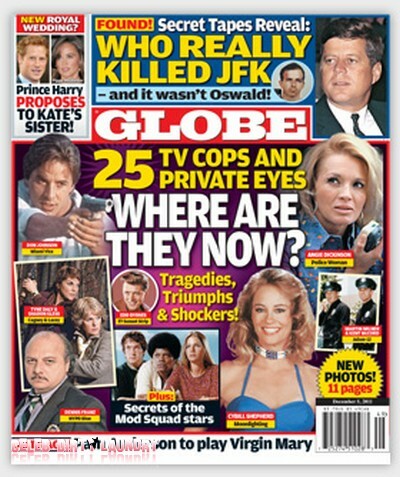 Also included in this week’s issue an exclusive 11-page special revealing where 25 of your favorite stars from TV’s cops and private eye shows are now. To find out all this and more, pick up the current issue of Globe!